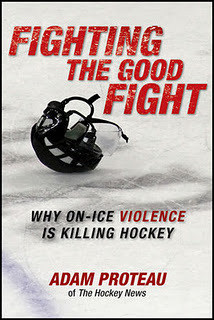 One of the more important hockey books of 2011 has to be Adam Proteau's anti-violence campaign in Fighting The Good Fight: Why On Ice Violence Is Killing The Good Fight. I recently had the chance to sit down and interview Proteau and talk about some very pertinent topics. 1. Do hockey fights really sell tickets? Or do pro leagues condone aggressive physical play to allow weaker teams and players a chance to compete against truly superior stars, therefore staying in games and playoff races thus giving fans hope and reasons to buy tickets? I think it's the latter. And the mushrooming of the enforcer role in particular around the time of NHL expansion says it all for me. Time and again, the league has shown itself to be a copycat entity, where teams look at what succeed – or at least, what is allowed to count as success – and attempt to copy it: think of the defense-first Dead Puck Era, for example. And around the time of expansion, the Philadelphia Flyers were permitted to maraud over other their competition with what now would be regarded as cartoonish violence – so what did all the other GMs do? Of course, most thought they needed an enforcer or two as well. And so, combined with the coast-to-coast indoctrination on Hockey Night In Canada's first intermission show, the current culture was deeply ingrained in a generation. But as we saw with the ultra-talented Montreal Canadiens - who beat the Flyers in a direct repudiation of that thuggish mentality not long after Philly won their only two Stanley Cups – that is not the only way the game can or should be played. 2. Hockey has always been a very physical game complete with fighting. How can we go about changing the culture to eliminate fighting? I don't think fighting will ever be eliminated, any moreso than it has been totally eradicated from basketball, baseball or any pro sport. Guys will lose it on each other. But there's a base minimum of behavior standards required by a sport's administration, and for too long the NHL and North American hockey on the whole have been too arrogant and/or blinded by profit to even pretend to enforce one. For me, it has to start with the elimination of the designated puncher role. If you cannot play the game at its highest levels, but punch at or above your weight and can do so while balancing on skates, you're a relic of a bygone time who can either go train for mixed martial arts – or, and here's a thought, be a better player! There's far more that can be done that I discuss in the book. Education of players as to the serious consequences of concussions and all physical risks (including playing without visors) is paramount, as are much tougher supplementary discipline rulings. Looks like the NHL is better in the latter regard, but not nearly where they ought to be. 3. One of the trends I hate most in hockey right now is when a player is attacked for throwing a clean hit. In such a case the said player usually has to fight to defend himself. Should he be punished with game expulsion, too? How do you handle that? That's a good question. I think the instigator rule needs far more teeth than it has at present. If a player truly isn't interested in fighting, he should be skating the other way. But if he gets his hand up to protect himself when he's blindsided, I wouldn't suspend him at all. Certainly some grey area there. But back to your first point – that constant scrumming and fighting is a big drag for me, too. I think there almost needs to be a time clock for the next faceoff, or a harder line on facewashing after clean hits. It's ridiculous. 4. Pests in hockey are not a trend, but they are a major reason for violence and increased aggression on the ice. Can we realistically change hockey's culture of fighting and violence without cracking down on pests? No, but I've never understood the logic behind the "if you cut down on fights, stick work goes through the roof" argument. The answer is cracking down across the board – pests, dirty players, stick artists, etc. Everyone gets placed on notice. Funny how none of these things ever seem to matter in the playoffs, eh? Guys are as intense as ever and yet can control themselves in a way they can't in the regular season, when games count not nearly so much. A responsible league demands more from all its players. 5. Physicality in hockey is often clean, as in the form of bodychecking. But somewhere along the line bodychecking did not become so much about separating the opponent from the puck but about devastating the puck carrier. How did this evolve? Despite the mounting injuries, has anyone in hockey argued to return bodychecking to it's original intent? I think it stems from the "Rock 'Em, Sock 'Em", sports TV highlight-reel-enabled promotion of it that doesn't focus any attention whatsoever on the physiological damage done to the victim (and in many cases, the victimizer as well). When Eric Lindros was being cut down almost methodically, he was called "soft" and "not smart enough to keep his head up" and Scott Stevens was lionized. But as we've seen with Sidney Crosby and others, the game moves too quickly now . Players would have to have heads on a 360 degree swivel to be as safe as they should be out there. Kerry Fraser talked about bodychecking methods in my book. And I agree with him when he says the skill has to be re-taught such that players aren't exploding their bodies upward as they drive into their opponent. It's a subtle, but imporant difference. 6. Organizations like Hockey Canada have made instrumental strides in changing hockey's culture in regards to dangerous hits from behind. Can hockey's culture be changed by such grassroots levels without the NHL? Or does the NHL have to buy in for this to succeed? It has to start with the NHL. There are no kids playing out there, no coaches, no referees, who haven't aspired to being in the NHL. The league sets the tone for the game in nearly every other regard, and for them to pretend they're not responsible in that regard is just blatantly wrong to me. 7. Bill Masterton died as a direct result of a NHL hockey accident, banging his head on the ice after a big hit. It took 29 years after that before every NHL player wore a helmet. Is there any realistic reason to believe the NHL will ever be enlightened? I'm optimistic that, in the long run, the NHL will have been either shamed into changing for the better, or will finally wake up when the talent pool for the sport dries up significantly. I lean toward the "shaming" argument, meaning that I think either a lawsuit, death on the ice, or increased public pressure will push them along into modernity. But the conservative element will have to be dragging kicking and screaming every inch of the way. That's hockey. 8. Do you think we will see another NHL player die on the ice in our lifetime? Unfortunately, yes. Most people in Southern Ontario will remember the name Don Sanderson for a very long time. And I've talked to enough hockey people who think the NHL has beaten the odds to this point. Now, it could come with a check into the boards from behind, or from a Pacioretty-like devastating check, or of course, from a punch to the head or a bare skull smacking the ice. But this game is too dangerous and sees its athletes as replaceable. My bottom line is that we need to respect these guys, their post-career lives and their families far more than we do now. Just because they make fantastic livings does not give us the right to watch them cut down for our "entertainment". Be sure to check out Adam Proteau's Fighting The Good Fight: Why On Ice Violence Is Killing The Good Fight in a bookstore near you.